Safety, performance and ventilation are the perfect trinity of the road helmet world and every major helmet company has labored to crack the code. 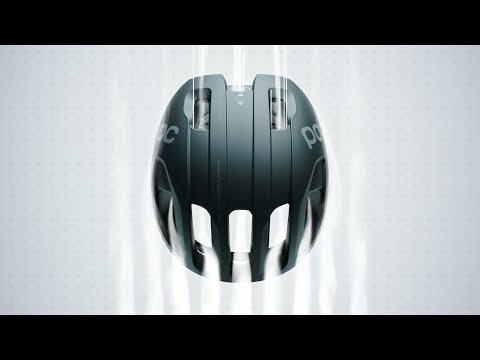 As POC see's it, the Ventral SPIN sets a new benchmark for aerodynamic performance, safety and ventilation in a road bike helmet. Designed and created using feedback from professional riders in the Cannondale – drapac Pro Cycling Team, POC's aerodynamic experts in the WATTS Lab, and combined with the company's experience and extensive computational fluid dynamic simulation and testing, the Ventral SPIN has been developed and analyzed from every crucial perspective. The Ventral design as an aero helmet has one story, while the integration of POC's patent-pending innovative SPIN rotational impact protection system, which while having a similar set of goals as the MIPS layer protection system, achieves reduced shearing force protection with a specially developed pad system. SPIN refers to Shearing Pad INside. Medical experts in the POC Lab know that oblique impacts are common in cycling and can cause serious head injury due to a rotation of the helmet and head. That rotation at impact causes shearing or twisting of the brain within the skull, which leads to tissue damage beyond point of impact and the rebound effect. To counter oblique impacts, POC has created SPIN pads, which are optimized to provide rotational impact protection based on the precise location of the skull and pads inside the helmet. The pads feature silicon inside, which allows the movement. POC still uses the excellent Polygiene pad covers to wick away moisture and prevent funk. The objective of SPIN is to minimize the effects of an oblique fall by allowing the helmet to move relative to the head. With a properly fitted helmet you get the external impact protection, then the pads allow the helmet to rotate, reducing the shearing forces of rotation. That this technology merely replaces existing pads, there is no real weight gain or need for an expanded shell size to accommodate any layered protection system. The Ventral SPIN;s shape and design combines the ventilation process with the aerodynamic requirements by leading air through the helmet, instead of around it, which significantly reduces wake behind it and improves the helmet’s aerodynamic properties. The Ventral SPIN has been designed with specific airflow zones in the helmet to create different pressure zones, inspired by the Venturi effect, which has the effect of increasing airflow and speed allowing the helmet to pass through the air with greater ease and efficiency. The airflow zones also create superior ventilation and cooling which improve the overall performance of the helmet. The tie back to aerodynamics takes place as the air exits, and and the residual air travelling over and around the helmet is managed by an aerodynamically optimized trailing edge, which reduces turbulence and generates a longer linear airflow off the helmet and rider, improving the helmet and rider’s aerodynamic performance. Of course POC includes their rather strong standard technologies and features. The full wrap polycarbonate shell protects the EPS foam and liner from accidental impact. The fit and retention system is clean and easy to use while being highly effective. The straps are integrated with the liner, with ideal exit points and one-hand operated clip. Glasses easily integrate while in use, and the eyewear garage system is great at holding your expensive shades when you don't want to wear them. The Ventral SPIN is competitively light, with the added protection of SPIN, and superior ventilation and aerodynamics. Isn't that what you have been waiting for?